This book is not the kind of book I would normally put on my must read list. I am normally more prone to read books that take place in an earlier time period or are of the fantasy group. I have to make an exception for this book. It is every thing an action packed novel should be. It has a great story line, enough action and suspense for anyone to be pleased, and is totally unpredictable. I my self found that I was surprised at the ending. All in all it was a definite must read for anyone who has James Bond as their hero. 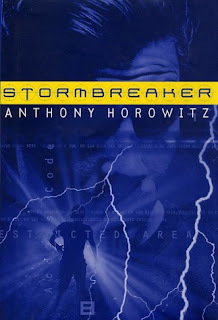 This book is about a 14 year old boy (Alex Rider) who's uncle is suddenly killed in a car accident, or so he is told. He could have survived, the police had said if he had only worn his seat belt. His uncle being a Bank employee always was away on business and was an all together cautions man. Alex knows his uncle always wore his seat belt so is suspicious. He checks the local car junk yard to only see that in fact his uncles car had many bullet holes in it side. It is obvious that his uncle had not been killed by any oncoming vehicle. Later on he is not at all surprised to find that his uncles bank that he worked for never existed, and that his uncle had been a spy. What he is surprised about is that they want him to work for them. They say that there is something suspicious about a man named Herod Sayle and his new computer called the stormbreaker. They want to send him to Cornwall on the same mission that his uncle had been killed on.